Cross-breed or hybrid, in biology, refers to a result of sexual reproduction and its result between two plants or animals belonging to different species, genera, varieties or breeds. The process of hybridization can only be successful if the genes of both the species are same. This will allow the combination of both these genes to form an embryo. Most of the hybrid animals are cross bred due to genetical research or merely curiosity. A tigon hybrid is the result of mating between a male tiger and a lioness. The mane of a male tigon is relatively shorter than the mane of a lion. The mane does not grow long because there are growth inhibitory genes that the species inherits from its mother. Another rare hybrid is the second-generation tigon that is called the litigon. It first appeared in Alipore, India in 1971. In a zoo, a female tigon mated with an Asiatic lion. The same pair mated several times and gave birth to seven litigons. A zorse is a hybrid between a horse and a zebra. 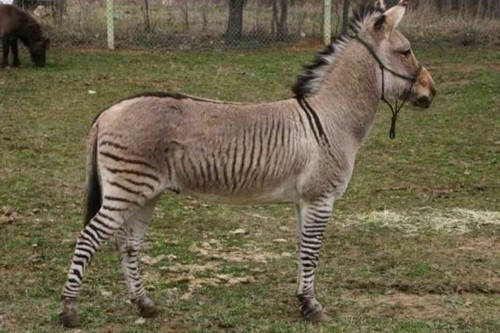 A zorse is also part of a wider category of hybrids known as zebroids. There is zonkey, zebrule, and zedonk. Usually, these species are sterile which makes it impossible to produce second generation offspring. The breeding of the zorse has been going on since the 19th century mainly for practical use. During the war in South Africa, ponies and zebras were mated to produce an animal that would be best for transport. The mating was carried out keeping into consideration the fact that zebras are immune to sleeping sickness whereas ponies do not have such qualities. A liger is a hybrid between a Tigress and a male lion. A liger may only exist when it is in captivity. It is typically larger in size than both of its parents. It is also bigger than a tigon. In fact, it is the biggest cat in the whole world with a maximum length of 3.5 meters. A leopon is a hybrid between a lioness and a male leopard. The head of a leopon resembles that of a lion; however, the rest of its body looks more similar to the leopard. Similar to the liger, a leopon can also be only produced in captivity. The Savannah cat is a hybrid between a domestic cat and serval. It is considered as the closest species to the domestic wild cat. It is a breed of an African wild cat and a normal cat. The F 1 male cat is the largest species of this kind. In behavior, the Savannah cat is more similar to a dog. It can be trained to carry out certain acts like walking on a leash and fetching objects. It is a social animal and is usually friendly to new people as well as other dogs and cats. It also possesses rather astonishing jumping abilities. They are also not afraid of the water. It is a hybrid between a polar bear and a grizzly bear. This hybrid was first recorded in 2006. The occurrence of this hybrid in natural environments is still the topic of research. It is a hybrid between a donkey and a zebra. In 1973, donkeys and zebras were mated within the Jerusalem zoo to create a breed that would be immune to diseases, and would be used as a draft animal. Presently, they are mostly being bred in Africa so that they can be used for trekking on the Mount Kenya. They are very successful because they are resistant to several diseases that are common in that area. This is a hybrid between a male false killer whale and a female bottlenose dolphin. It a very rare hybrid that was first recorded in Tokyo. However, the species could not survive for more than 200 days. It is a fertile species and can reproduce. They can also be seen at the Sea Life Park in America. This is not a hybrid in a strict sense. However, it is a natural pig breed that has descended from the wild boar. In specific terms, it is a cross between a European wild boar and a Hungarian pig. Like sheep, this breed possesses a hairy fleece which is why it is called a sheep-pig. This is a hybrid between a wolf and a domestic dog. Wolfdogs have been around for quite a long time. In fact, there is evidence that they existed around 10,000 years ago. Presently, this breed is produced used as military dogs or simply companion dogs. Famous examples are the Czechoslovakian wolf dog and the German Shepherd. Top 10 Most Beautiful Places To Visit Before You Die!